Thought about in this way, poetry is well suited to our fast-paced times, since it is a sort of condensed reading (and writing). Instead of spending days reading the latest airport novel – killing time, as people call it – we could read the poetry of Lyn Hejinian, Inger Christensen or one of the young poets we interview in this issue. Instead of killing time, we’d be filling it with purpose. 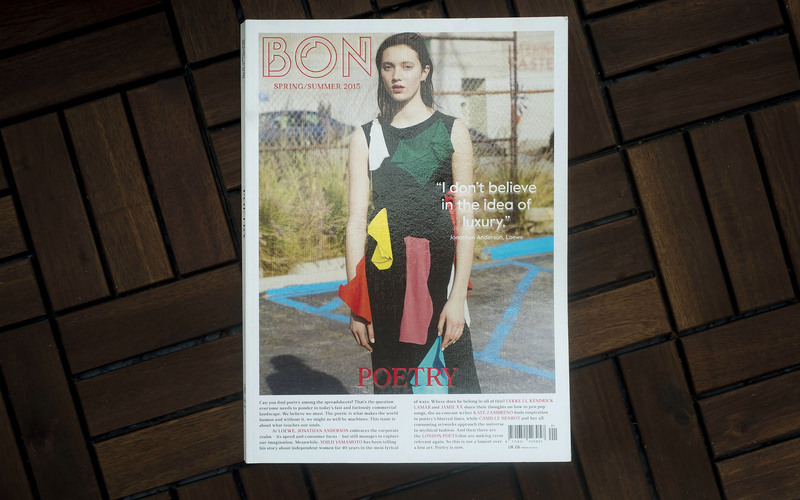 Bon Magazine S/S 2015, featuring Jonathan Anderson, Kendrick Lamar, Lykke Li, Kate Zambreno, Camille Henrot and five great and beautiful poets from London.